The Olympic champion Alistair Brownlee has pulled out of the weekend's big World Series Triathlon event in his home city due to injury. The First Direct Arena will light up in gold and silver tonight in honour of their medals at Rio. Alistair Brownlee matched the gold medal he won in London, with his younger brother Jonny beating his 2012 Bronze with a silver in Rio. The Brownlee Tri will be returning to Harewood House in Leeds for its third consecutive year on Saturday 24th September 2016. Alistair and Jonny Brownlee’s triathlon will once again offer Sprint and Super-Sprint distances for individuals and a Sprint relay for teams around the spectacular Harewood course. The 2016 Brownlee Tri will build on the success of the 2015 event, when over 6,000 people descended on the beautiful Harewood estate. With over 1600 registered participants, the event was a huge success bringing together triathletes of all ages and abilities to experience the course. We are excited to bring the Brownlee Tri back to Harewood House again this year. The 2015 event was great and enjoyed by many. We can’t wait to do it all over again, this time even bigger and better. The Brownlee Tri will be returning to Harewood House in Leeds in September details of the swim, bike and run route have now been confirmed. The 2015 Brownlee Tri will build on the success of the 2014 event by introducing a pontoon for the swim. The pontoon will take swimmers out to the deep water for the start of the Brownlee Tri and also provide a ramp to swim onto for exiting the lake. This year’s course will also offer a new challenge with a refreshed run route. Alistair and Jonny Brownlee’s popular triathlon will once again offer Sprint and Super Sprint distances for individuals, and a Sprint and Corporate Challenge relay for teams around the spectacular course. You can see full details of the route here. 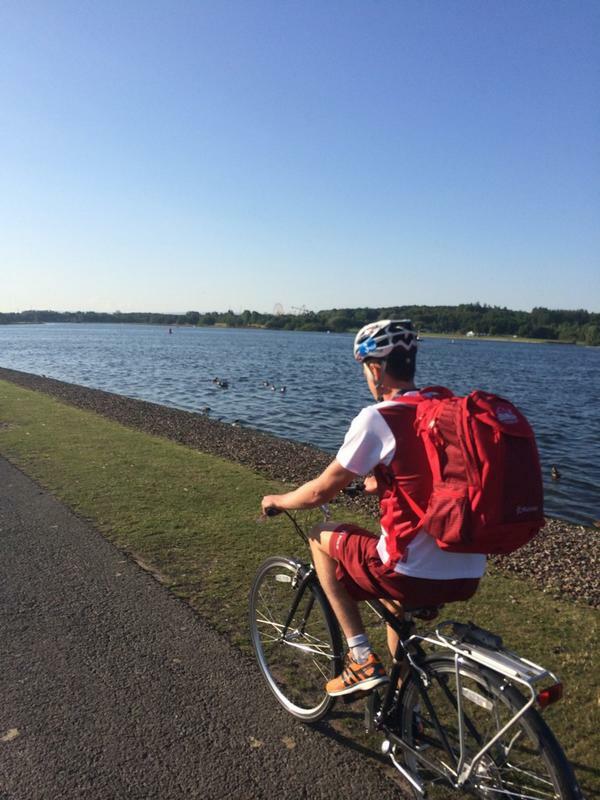 Leeds' Alistair Brownlee might have just won Gold in the Commonwealth Games Triathlon, but he couldn't resist jumping back on his bike to make the most of the warm weather. Olympic gold and bronze medal-winning triathletes Alistair and Jonathan Brownlee have been at Harewood House to promote the festival of cycling taking place over the Grand Depart weekend. And whilst testing out part of the Tour de Fance route which passes right by the house, they also took a detour to stop off at a well known local, as Sarah Clark reports. Yorkshire's Olympic triathletes - the Brownlee brothers - were back in Leeds today to open a new sports facility which is right on their doorstep. Alistair and Jonathan were joined by paralympic champion David Stone to open the Holt Park active centre which cost 28 million pounds to build. It is hoped the facility will offer services for the entire community as Rachel Townsend now reports. Olympians Alistair and Jonathan Brownlee alongside Paralympian David Stone were at the opening of a new sports centre in Leeds. The £28m development in Holt Park will have a twenty five metre swimming pool, gym as well as hydrotherapy facilities.